World-renowned physicist and bestselling author Stephen Hawking presents a revolutionary look at the momentous discoveries that changed our perception of the world with this first-ever compilation of seven classic works on physics and astronomy. His choice of landmark writings by some of the world's great thinkers traces the brilliant evolution of modern science and shows how each figure built upon the genius of his predecessors. 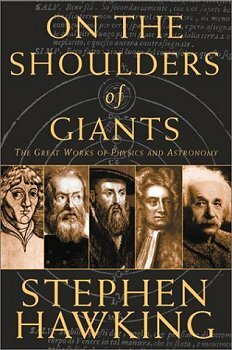 On the Shoulders of Giants includes, in their entirety, On the Revolution of Heavenly Spheres by Nicolaus Copernicus; Principia by Sir Isaac Newton; The Principle of Relativity by Albert Einstein; Dialogues Concerning Two Sciences by Galileo Galilei with Alfonso De Salvio; plus Mystery of the Cosmos, Harmony of the World, and Rudolphine Tables by Johannes Kepler. It includes an essay by each scientist preceded by biographies written by Hawking. The words of the title derive from a famous passage in a letter by scientist Isaac Newton. "If I have seen further," Newton wrote, "it is by standing upon the shoulders of giants." Theoretical physicist Stephen Hawking, himself a renowned far-sighted thinker, has compiled an anthology of the seven great classics in astronomy and physics. To each of these masterworks, Hawking adds an introductory essay that shows how each was built on previous discoveries. In addition, the author of A Brief History of Time provides penetrating biographies of Copernicus, Kepler, Galileo, Newton, and Einstein.